Willard Music -- Still a Mystery . . .
Back in December (Newsletter #003) we asked about a mysterious Laotian KY-8 contact with callsign "Willard Music." 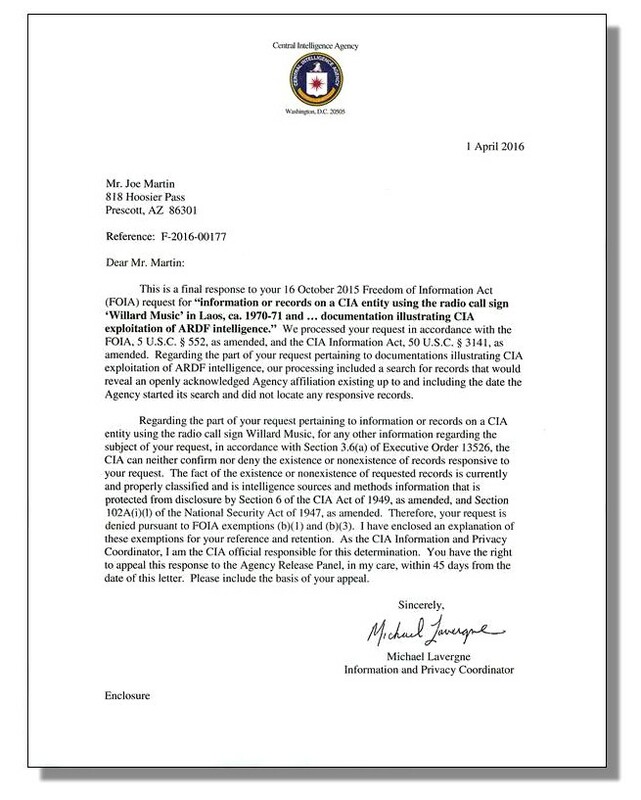 As promised, we submitted a FOIA request on the subject and, while we were at it, asked for anything relating to ARDF exploitation by those "controlled American sources." The answer was pretty much what we expected: "We have nothing openly acknowledged on ARDF, and if we have anything on Willard Music, you ain't gonna see it." Whether to waste time on an appeal, we haven't decided. At long last, CIA freely admits—or as freely as it ever admits anything—its role in the Laotian war, described in a 500+ page monograph entitled Undercover Armies: CIA and Surrogate Warfare in Laos, 1961-1973. There are redactions aplenty (natch) but it still makes for interesting reading and, coupling known facts with a little imagination, one can make an educated guess as to what Willard Music was or did. So, guys, if you had occasion to give Willard Music a call—and especially if he/she answered—drop us a line below and tell us about it. The truth is out there . . . .